>Perhaps you thought I’d never get to the pay-off promised for this series of posts. You’d be correct. I totally intended to spill all I could offer about small sizing. But the more I tried to put the answers into a set of blog posts, the more I came to accept that it’s not gonna happen in this blog-o-sphere. What has happened since I started down that road a couple of months ago is that I’ve had a brain blast. I decided to create small size designs and publish them as individual patterns. Since there is no proven market for girl/tween/teen sized crocheted garment patterns, generally big girl sizes 6 through 16, I have been unable to find a traditional publishing venue eager enough to help me go there. So I am planning to self-publish the lot. I know. I KNOW! I have said here that I am a crocheter, not a publisher. Never say never. Put the blame squarely on my friend and now my boss, Vashti Braha. Vashti has just rolled out the welcome mat for her new website, www.DesigningVashti.com, the ultimate crochet destination, pattern boutique and crochet information treasure trove. Using her uncanny powers of persuasion and threatening me with bodily harm if I didn’t cave in, Vashti talked me into testing the self-publishing waters by inviting me to contribute designs for her beautiful site. She offered me a comfy cyber-home for my new pattern line, DJC Designs, no deadlines, no hassles, and complete creative freedom. But she needed a couple of patterns in time for the shopping cart going live this week. YIKES! What to do… what to do… WHAT TO DO? I did not want to rush into the girl designs just yet. But I did have two pet projects that would take to download land really well. Both designs are more like sets of patterns, encompassing multiple samples and requiring a crap ton of pages to spit out. Think of these as fat patterns. Bloated patterns. Patterns with booklet tendencies. 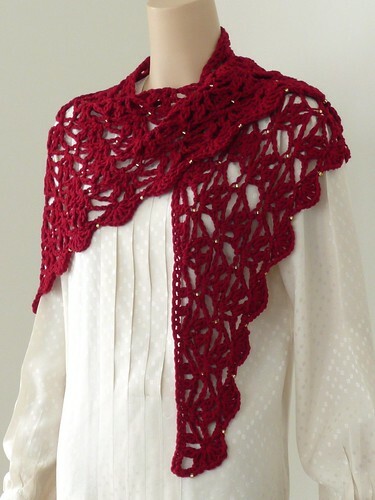 The first DJC Designs pattern now available is DJC: Triangular Shawl and Variations. Thanks to the designers’ options with Interweave, I retained rights for this little beaded wrap, originally published in the premier special issue of Interweave Crochet, 2004. Now featuring new stitch diagrams, six fresh shawl samples in various yarns, instructions and suggestions for many gauges and sizes, this deluxe version of the Triangular Shawl will become your go-to pattern for gorgeous, stash-busting stuff for yourself and for gift-giving. Next up will be DJC: PlayPlaid, a collection of four projects in a clever 3-color plaid stitch. This is the pattern that includes the pieces I showed in the CGOA 2010 Chain Link Fashion Show last month in Manchester, NH. And, if I stop blogging and start seriously crocheting, in the coming season you will see the debut of DJC Designs, Too!, a series of designs including tops, cardigans, skirts, dresses and whatever comes into my head, in girl sizes 6 to 16. Keep checking www.DesigningVashti.com for the latest DJC Designs patterns, or subscribe to the DesigningVashti newsletter for the heads-up. 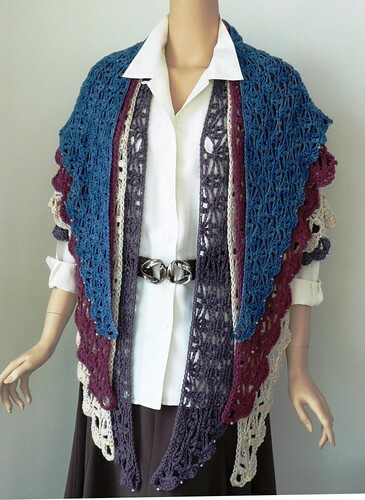 This entry was posted in crochet, Designer's Life, published design by dorischancrochet. Bookmark the permalink. >Even more reason to love Vashti's website! As a fan of your designs and a mother of two girls in that 6-16 size range I am anxiously awaiting your new patterns! >That "….and whatever comes into my head" gives me delicious goosebumps!I'm grooving on that runway photo. Good thing you made me wear those heels, the flats I had wouldn't have done the job. >YEA! I've got three girls at home (4, 6, & 8), so I can't wait to see what you will be publishing! I've been checking Vashti's site every day, waiting for her store to go live, lol. >Patterns for this oft-neglected size range should be a big hit! 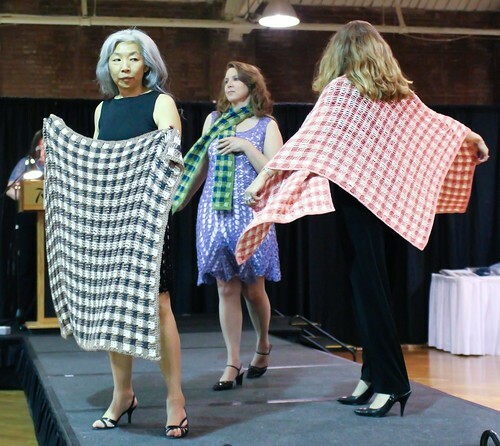 I loved those plaid designs shown in the Fashion Show! >I have been looking for pre-teen/young teen patterns for forever it seems. It seems what little you can find is either too young looking or not appropriate! And the bonus is I love your designs. >Ah, Jeez, Doris! At the risk of sounding creepy – I LOVE you!So concise, so modest, so perfectly petite. Thank you, thank you – no REALLY – thank you! I wanna follow you…oops…now that DID sound a little creepy…sorry, I'm a rather exhuberant girl. >LOVE IT! It is so hard to find patterns for girls in that age range. My girl is 4 and I feel like I'm hoarding the few great patterns I can find to make her school clothes. >Can't wait to see more patterns in that age range. I have been sizing up patterns for my two 7 year old girls, and they need more than just bigger toddler things! >Like everyone else, I just can't wait for the girl designs. There are so many baby patterns around, but who has time to crochet with a baby in the house? Now that my little one is in school, I can make her the most fashionable girl in first grade! >Hey Teri,For pattern support, please go to Ravelry.com.